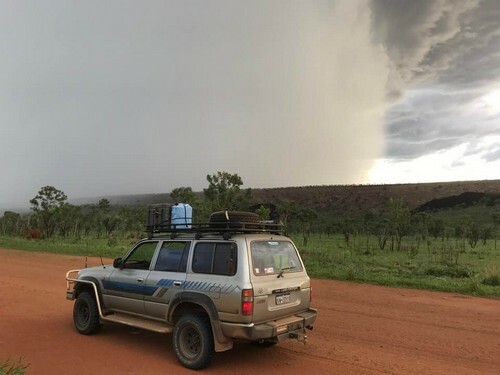 Kimberley and NT News: What will the 2019 wet season bring? And how is it looking so far? I hope 2019 has been treating you well! As for myself, I am currently recovering from a bad cold which then developed into a bad sinusitis. So if you find spelling errors and grammatical mistakes in this email (um, more than usual, I mean), my excuse is that my brain is still mush. Everybody would love to know what exactly the next wet season will bring. Forecasting when and where and how much rain will fall is notoriously unreliable business, which may be why such attempts are called "climate outlook" and not forecasts. To illustrate that, here is the newsletter issue from last season that covered the outlook for 2018. With that said, lets see what the Bureau of Meteorology (BOM) has to say about the 2019 wet season. In short, for the Kimberley and the western parts of the northern NT (which are the parts most relevant to most of my readers) the next three months, February to April, are expected to be warmer and drier than average. Where last year the Pacific Ocean was approaching La Niña threshold and a La Niña alert was active, this year the tropical waters are near El Niño levels. (La Niña: early monsoon onset, lots of rain. So, not a full blown El Niño event, the indicators are merely pointing slightly in that direction. The BOM also mentions that most of the Australian climate drivers are currently neutral, which means the weather will be more impacted by local effects. The BOM outlook is not the only outlook in existence. The University of Southern Queensland also published one. It also predicts warmer than average days and nights for the next three months, but the varying models it looks at indicate close to average rainfall. So what does that mean for the next season? As I pointed out in the beginning, these outlooks are not meant to be reliable forecasts. Historical outlook accuracy is poor to moderate, depending on which parameters you look at. Also, outlooks only look at averages across a region. Things can still look very different locally. Road opening dates are determined by the rain that falls in March/April and not now. No matter how this wet season ultimately shapes up, a stray late cyclone is always a possibility. It only takes one to delay road opening dates in the region it hits. If you are planning an early season trip, be flexible. Be prepared to adapt your plans to the conditions as needed. As every year, I will keep you informed about how things develop. The last two wet seasons were of the bigger variety, and around this time of the year I was already sending you reports of big downpours and flooded roads. You can dig through the back issues if you're curious. With the country currently being warmer than average, the storms have been particularly impressive and the winds gusty. photos of a storm over the Leopold Ranges on the Gibb River Road. The photos are of the same storm, taken from both sides of Inglis Gap. While thunderstorms are always impressive, and while they can dump a huge amount of water in a very short time, they are isolated and short lived, and so are any resulting floods and road closures. The temperatures also drop only for a moment, after that you can enjoy the increased humidity... Not! Stations report record lows for their December rainfall (e.g. 50ml all up at Drysdale, the lowest since they started keeping records). January weather so far looks like what you'd usually expect for December. Many creeks and rivers aren't flowing yet and the Barnett River has not been up at all. Overall rainfall for the whole wet season since September averages around 200 mm across the Kimberley. Darwin got almost twice that, yet that is still less than half of what they usually get until the end of January. So is the BOM outlook right after all? Will the wet season be a hot and dry disaster? Again, this does not mean anything yet. It's only January and we have no idea yet what this wet season will bring. Locals feel reminded of the 2000 wet season: Late start, late end, massive rains and floods in March/April. This late onset could lead to a poor wet season, it could lead to a late wet season (as in 2000), or it could lead to a perfectly average wet season with a late start. It is impossible to predict ANYTHING at this stage. 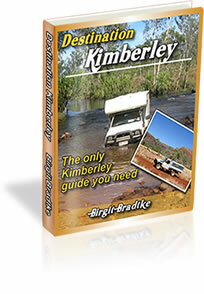 I love "Destination Kimberley" and the other two in the series) and wish other areas in Oz had similar books. Destination Kimberley answers so many questions I didn't know I didn't know. 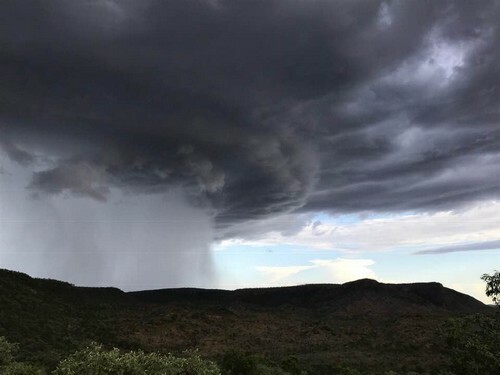 For days everybody had been watching a monsoonal trough that had been sitting off the Kimberley coast, deepening and moving in. The tropical low was forecast to possibly develop into a tropical cyclone today (Thursday). As it stands, the heavy rains and winds reached the coast overnight, with the result that the Cape Leveque Road is currently closed to all traffic. Not just Cape Leveque is affected, Broome is very wet, too, and the surf is up. How far the rain will move inland and who else will benefit from it remains to be seen. We also don't know yet if this monsoonal activity will continue, but hey, it's a start. Let's hope that this is the break everybody has been waiting for, and that in the next newsletter I can report some substantial, widespread rains! Cable Beach has just been closed for all water based activities due to a croc sighting near the Surf Club. If the croc hangs around it will be removed or relocated. For now, stay away from the water. Many new subscribers are joining this newsletter list at this time of the year. If you are one of them, I strongly recommend you also read through the last two issues because they contained important information for people planning to travel in 2019. If you still need to book car hire and/or accommodation for the peak season, make sure you read issue #72 and issue #73 asap. Issue #72 had the general recommendations, issue #73 added important details. Depending on your exact travel plans you may already have difficulties booking EXACTLY what you want. "Spot on about booking early especially during peak season. I have made a number of enquiries recently for two bedroom accommodation in Cable Beach during the winter school holidays and have had no luck so far. Flights from Melbourne are very limited as well. I fear we have missed the boat this year which is a real bummer." If you plan to hire a car, issue #73 is a must read and not just for new subscribers! If you have been subscribed for longer but missed the last issue (and who has time for reading newsletters just before Christmas?) make sure you read the update on Australian 4WD Hire. And, new subscribers, if you have the time, then I recommend you work your way through some of last year's back issues. (You find them on this page). You will find lots of useful bits and pieces and a huge amount of reader feedback that will give you a very good idea of what to expect, especially during the busier times of the year. Last year, Singapore Airlines offered several direct flights between Singapore and Broome as a trial. It must have been successful because they are offering them again this year. If you are from London, Manchester, Munich, Frankfurt or Düsseldorf, (or know someone who is,) then this is an opportunity to save time and money on your flight to Broome. However, it does mean that you are very restricted in your planning because there are only four flights. The dates are June 13, 17, 20 and 24 (both directions). The price for a return flight is $597 and you can book through (online) travel agents, NOT on the Singapore Airlines website. I am not sure yet when the next newsletter will be out. If the weather remains dry and there aren't any other updates to report, it may be a few weeks. On the other hand I have a couple of topics in the back of my head that I'd like to cover here regardless. In any case, you'll hear from me again when I have interesting things to write about! (c) 2005-2019, Birgit Bradtke. All rights reserved.